Important: please sign up before April 28 by transferring a deposit of €80 ! No better time than September to admire the gorgious scenery, the culture, traditions and way of living of our German speaking fellow citizens. Our two days outing in the Eastern part of Belgium will give us the opportunity to discover famous nature spots, rich merchant houses and romantic castles. We will also spend time to get ourselfes acquainted with the region’s history, economy and institutions. We will be lodged (B&B) in the unique setting of Kloster Heidberg, an 18th century convent of the nuns of the order of the Recollects and now the seminar and event center of the German speaking community of Belgium. Saturday’s programme will feature, among others, a visit of the parliament of the German-speaking community, a discovery of the three border country and Kelmis (Moresnet) where we will have a guided tour of the Museum of the Neutral Territory of Moresnet. On our way back to Eupen we will pass the American cemetery of Henri Chapelle. During our supper in Kloster Heidberg we will learn more about the history of the Convent. 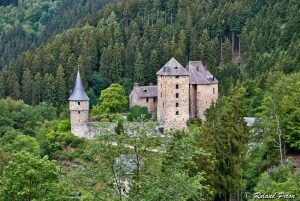 On Sunday, following a guided tour in Eupen, we will visit Raeren castle and its pottery museum and have a short walk on the Fagnes. After lunch in restaurant “Terminus” in Montenau, we are expected at Reinhardstein castle. We then will return to Eupen via the Gileppe lake and dam. A local guide will join us on the bus, to comment on the visits and provide further background information about the region. The Kloster Heidberg Center is situated 200 meters from the Eupen railway station (Bahnhofstrasse, 4, 4700 Eupen), which is the end station of the express train from Oostende, with stops in Brugge, Gent, Brussels, Leuven, Liège and Verviers. For those coming by car there is ample parking space next to the Center. The outing is limited to 35 persons. Full details including the programme and exact costs will be available in early spring 2019. We plan for a price of about € 220 pp. for two people sharing a room and € 250 for a single room. If you would like to participate in this event and want us to secure a room (double or single) for you, you are kindly invited to indicate your interest as soon as possible to André Ceulemans (andre.ceulemans6@telenet.be / mobile 0474 46 40 09) and Johan Vanbrabant ( johan.vanbrabant3@telenet.be / mobile 0475/27 69 72) while transfering a deposit of € 80 to our bank account (National Trust Belgium IBAN : BE 17 0016 2021) by Sunday April 28th at the latest. The Kloster Heidberg Center is situated 200 meters from the Eupen railway station, the end station of the express train from Oostende, which stops in Brugge, Gent, Brussels, Leuven, Liège and Verviers. For those who decide to come by car there is ample parking space at the Center. For the entire outing we will use a coach, which departs from and returns to the Kloster Heidberg Center. Meals ( 2 lunches and 1 dinner) will consist of 3 courses incl. 1 glass of wine/beer and coffee. Vegetarians please notify at registration.